Looking for a restaurant-style meal that's fast and easy to make? This salmon dish will have your family feeling like they're dining in a fine restaurant, but it won't take you much time at all, and it's nutritious, too. Whisk together orange juice, ginger, garlic, and lime juice to make a marinade. Place salmon steaks into a sealable container or a large plastic bag and add marinade. Seal container tightly; toss lightly. 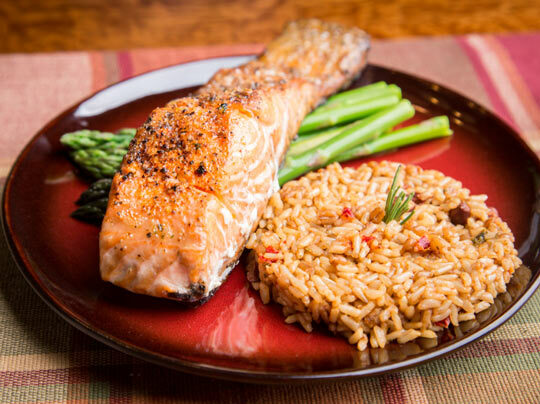 Place the salmon steaks on a foil-lined baking or broiling pan, reserve marinade. Sprinkle with red pepper flakes and fresh ground pepper to taste. Place in oven on center rack. Broil until fish is cooked thoroughly and flakes easily, about 8-10 minutes, basting with the marinade a time or two during cooking to keep them moist. Add green onion slices before serving. Serving suggestion: Serve with asparagus and brown rice.